AMC has just announced the renewal of its hit zombie series The Walking Dead, but with the renewal the show also delivered some saddening news, and it involves a farewell. Executive Producer Glen Mazzara says that, while he has very much enjoyed being part of this incredible story, he feels as if he’s told all he can with the current cast and will move on to other projects. This farewell definitely is a shakeup for the series, and it’s hard to know how his departure will influence the show — both in story and in atmosphere. Chances are not much will change (not much changed when Mazzara stepped in for Frank Darabont), but it’s always interesting to see a new producer’s take on a show, for better or for worse. This news is, actually, a bit shocking. It seems strange to me that a producer would leave a show, only after a year of being there, just as the show is picking up incredible steam. The show accumulated incredible ratings this past fall, and even took the gold in the competition against all other networks in the 18-49 adult demographic. This show is, and probably will continue to be, a powerhouse for at least a few more seasons. As long as the zombie fad is still out there. This is really only the mainstream zombie series on television, so it has an incredible following and it’s found its niche in the marketplace. Perhaps Mazzara really is just eager to move on to explore different stories. Or maybe he didn’t mesh well with the team. Who knows, really. 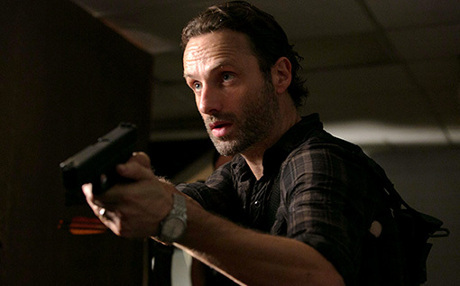 But it will be interesting to see who steps into his shoes for The Walking Dead season 4. So, I think, basically what this means is that I will soon be getting a phone call for a showrunning gig? What do you think? Think I could pull it off? I would, of course, offer Lindsay Lohan a starring role.